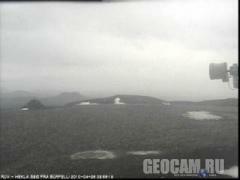 Live webcam shows the view of Mount Sinabung in Indonesia in real time. The image is updated every minute. Mount Sinabung is a Pleistocene-to-Holocene stratovolcano of andesite and dacite in the Karo plateau of Karo Regency, North Sumatra, Indonesia, 25 miles from the Lake Toba supervolcano. Webcam is Frozen! can you restart the program or the server so it works again? Time lapse does well with this one image a minute. Not too bad! I heard a bang from north west of Darwin at 3.30 am Darwin time a few days back. That would be 5.30-6.00am in Sinabung? Was that the time it erupted?